There are some things which reside at the periphery of the Loch Ness Mystery and sometimes present themselves as a mystery within a mystery. I had been meaning to write on this object for some time, but was awaiting further information which has now arrived. One could best sum it up in the words of Nicholas Witchell's "The Loch Ness Story", back in 1974 (p.16 1st edition). However, the story of this stone goes further back than this. Ted Holiday first mentioned it in his 1968 book, "The Great Orm of Loch Ness", where he recounts something akin to a jungle expedition in 1965. On June 15th I had now been at Loch Ness for nine days. Heavy rain pounded down during breakfast, After going round to Strone for a last word with Clem and Brian, who were leaving for London, I finally spent the rest of the morning searching the grounds of derelict Balmacaan House for a view of the ancient carved stones on which an unidentified creature is depicted. After beating the rhododendron jungle for an hour, I gave the search up as hopeless. In his dealings with the Orm the neolithic artist seems to have adopted one of two stylized approaches. Usually, the creature was represented in a sort of plan-view with its body coiled in two wide undulations. The head was ovoid with pear-shaped eyes and a bluntly conical nose. This particular treatment was often incorporated with a symbolic device or pattern known to Archaeologists as a 'Z rod' which may possibly have indicated the rank of the leader for whom the carving was executed. The alternative rendering was a depiction of the head and neck alone. Usually this showed a long neck topped by a small head embellished with a number of feelers or tentacles. 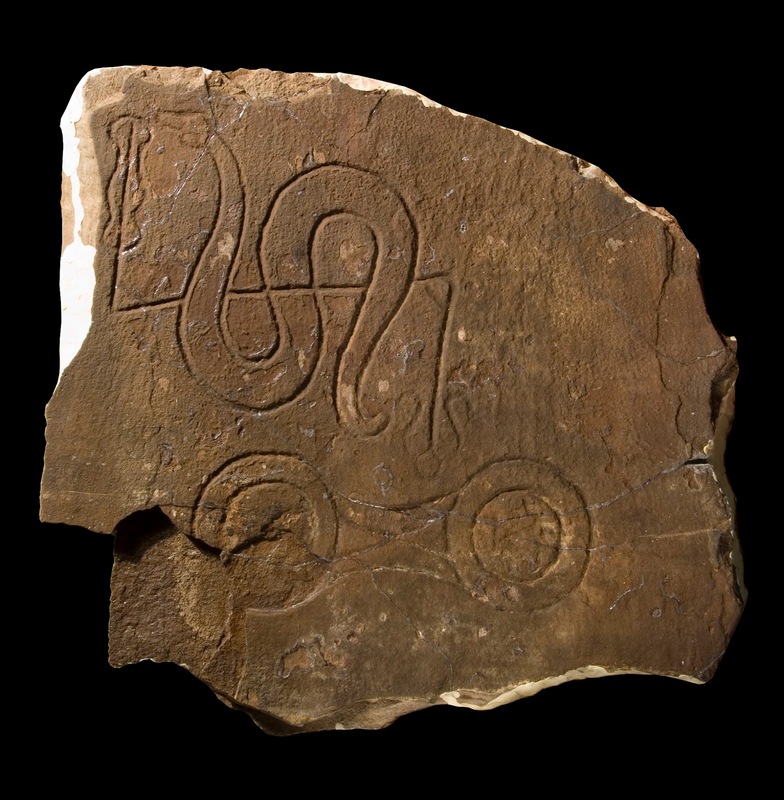 A neolithic carving found at Balmacaan, near Loch Ness. The creature appears to be a stylized depiction of the Orm and incorporates numerous features reported by witnesses such as vertical undulations, wide head, oval eyes and conical nose. One could of course argue that the conical nose, oval eyes and sinusoidal curves were equally emblematic of a common snake. However, the discovery of the stone beside the shores of Loch Ness made this more than a matter of land based serpents. To delve further into this neolithic puzzle, we need to know more about the stone. Though the stone was said to reside at Balmacaan house, the actual site of discovery was beside the river Enrick near Urquhart Bay. According to William Mackay in the 1886 Proceedings of the Society of Antiquaries of Scotland, it was accidentally dug up on Drumbuie Farm about 1869 along with another symbol stone which were laying on top of a cairn. The site of that discovery gives the stone its proper title of the "Drumbuie Stone". However, it was removed to the Earl of Seafield's estate prior to 1886. The original location is shown below as the central green circle. As it turns out, Ted Holiday was wasting his time looking for the stone amongst the rhododendrons in 1965 as it had been removed ten years earlier to the Royal Museum of Scotland in Edinburgh for safekeeping. The stone had left Loch Ness, but did the mystery of its serpent remain? The stone is itself one of over 300 items known as Pictish symbol stones. The Picts were a mysterious race of people who populated the northern parts of Scotland, but little is known of their culture, even after converting to Christianity. The stones are rough hewn slabs of stone carved with known and unknown objects which are found either erect or laid flat on cairns and so on. They are to be found all over the north of Scotland with the preponderance being located in the north east and they date between the 6th and 9th centuries AD. They have presented a bit of a challenge to archaeologists since the symbols carved on them have remained undeciphered and represent a kind of Highland Hieroglyphics lacking a Highland Rosetta Stone to unlock them. By that I mean, some carvings are clear enough in depicting boar, fish, eagles, deer and so on. Others appear to be more abstract, though some may represent man made objects such as mirrors and combs. But why they are there and how each carving on a given stone relates to those around it has no universally accepted solution. The Drumbuie stone is no exception in that the serpent is depicted with a construct known as a "Z rod" interlacing it. What this and the double disc below it signifies is a matter of unresolved conjecture. Such abstract symbols are seen across Scotland adorning stones in various ways. When I considered these discs and the serpent, I thought of Holiday's subsequent book, "The Dragon and the Disc" which explores the links between alleged ancient dragon and disc worshipping cultures. Surely, the Drumbuie stone would be "Exhibit A" in such a theory with its combined discs and serpent? But, surprisingly, Holiday (as far as I can tell), makes no mention of the stone in his book. A curious omission, I thought. Then again, maybe not. As I continued to research the matter, I found a very useful website mapping out the large number of symbol stones across Scotland. It is run by Strathclyde University and can be found here. Some observations can be made using their information. Firstly, there are 23 symbol stones containing a serpent and 13 of these are this serpent plus Z-rod combination. Moreover, these serpents are combined with so many different other symbols as to look almost random in occurence. But the second point is that the other serpent stones are located largely in the east of Scotland where there is a dearth of loch monster traditions. Most of the folkloric tales of kelpies, water horses and water bulls reside in the west and centre of the Highlands. This is shown in a rough overlay I did of the distribution of loch monsters and symbol stones. The folkloric lochs are shown as white circles and the symbol stones as red circles. One can almost argue for a negative correlation between the two classes. The conclusion is that the serpent carvings are not related to any ancient idea of loch monsters (though one cannot quite discount the river varieties). That may or may not be a surprise, as it depends on what the function of such a Pictish symbol stone was. Was the serpent a real snake or a symbol for something like a notable family or leader? That we'll leave to the experts, but perhaps Holiday himself came to realise the stone serpent was nothing to do with the Loch Ness Monster when he omitted it from his Dragon book. I said the stone was sent to Edinburgh in 1955 and so we complete the story with its current status. I contacted one of the curators who confirmed it was still there and he kindly sent me the latest picture of it, which I reproduce with their permission. At last, we can see the actual stone and not sketches (probably derived from rubbings). The stone is not on display at the museum due to its somewhat fragile condition and it awaits some restoration work. Therefore, it remains boxed up at the museum's warehouse facility and was not amenable to a visit by myself. At least we know this curious stone still exists and is in good hands. The Loch Ness Monster may continue to be a mystery, but there is no mystery connecting it to this stone. The mystery of this stone firmly resides in the little known ways and customs of the Pictish people. There may be other symbols that equate to creatures the Picts regarded as aquatic and monstrous, such as those on the Aberlemno II stone and the well known Pictish Beast. To these we must look for clues as to the monster lore of these people. Balmacaan House was the property of the Earl of Seaforth and was located on his estate to the south west of Drumnadrochit (see map from 1930s with house in bottom left). 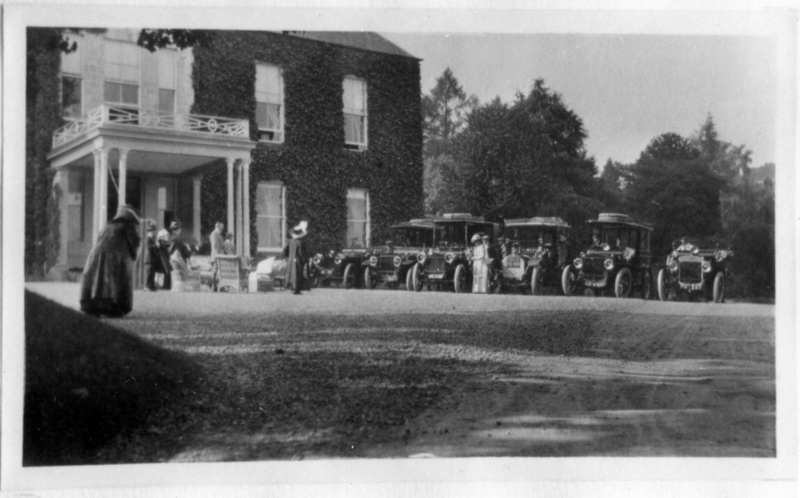 The house and its 40,000 acres would have served as hunting grounds and indeed were rented to rich clientele such as the American Bradley Martin. It was used as a home for war evacuees in the 1940s but was evidently abandoned as a sale of assets in 1942 suggested its days were over (perhaps due to the onerous death duties imposed by the British Labour Party on the aristocracy). By the time Ted Holiday arrived with his machete in 1965, the house was in a severe state of disrepair and was soon demolished, perhaps in the 1970s. There were reports of ghosts appearing as the house was levelled! To all UK readers, Channel 5 has two hours of sea monster programs and Nessie may make an appearance. Programs start at 7pm.